When my cousin came to visit me in France last year, he commented that the children here act like “little adults.” It’s not an uncommon remark, and it may be because French children are expected to eat like little adults. It is common knowledge that the French take their food VERY seriously; these people don’t mess around and school lunches are no exception. While it’s certainly nothing fancy, the French would describe it as correct, which simply means that it’s well-balanced, affordable and perfectly fine to eat. 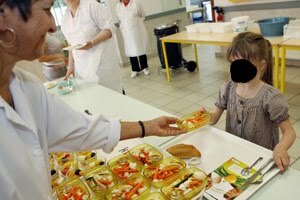 French children have the option of eating in the school cafeteria or going home for lunch. For those who decide to eat at the cantine, lunch lasts anywhere from 30 minutes to an hour, usually followed by a comparable amount of recess. Cafeteria workers and other assistants are there to supervise the meal. They make sure that each child tries what is on his plate and that food does not go to waste unnecessarily. They’re also available to help younger children cut their meat or peel their fruit. For children ages 3-6, meals are served family style at small tables using real plates, glasses and silverware. Self serve cafeteria lines are generally reserved for older children, which allows for speedier service and more autonomy. Everyone drinks water. Lunch begins with the entrée, usually some sort of small salad or soup followed by the main dish. Typically you’ll have a protein source with a side of vegetables or carbohydrates. Dessert consists of fruit and yogurt more often than not. Treats such as cake, pastries and other sugary desserts only make their way to the table once a week at the cafeteria, though most French children enjoy some sort of cookie around 4:30 or 5:00 for their afternoon snack. Since 2008, organic food has been making regular appearances at cafeterias here in Toulouse. 25,000 elementary school students currently enjoy meals that contain one organic item and organic bread is served daily. The idea is that students who eat lunch at school will have consumed the equivalent of one organic meal over the course of the week. Not bad! Families pay for their children’s lunches depending on their earnings and the number of children they’re supporting. For those earning less than €914 per month (after taxes), lunch is free. For families earning more than €4500 per month, lunch costs €3.45. For those whose earnings fall somewhere in between, they can expect to pay between €1.65 and €3.30. If you’re a teacher who would like to eat the school lunch, it costs €3.80. For prices to fall into these ranges, the meals are partially subsidized by the government. The government is also very aware that American tastes are catching on over here –fast food, snacking, and soda are very popular. In an effort to curb these bad habits, vending machines have been banned from schools since 2005. An extensive ad campaign has also been in effect for several years now. Advertisements run on TV and radio reminding everyone to: eat five fruits and vegetables every day, to exercise regularly, to avoid snacking in between meals and to consume three dairy products. It gets in your head after a while. It’s surprisingly hard to ignore. And maybe that’s the biggest difference: there’s no pandering to children’s tastes around here. The expectation is that parents, and in this case schools, feed their children things that they too would eat. Both the preparation and the presentation send a clear message: we care about you; we want you to eat well, take your time and use good manners. Bon appétit! I’ve included a sample menu below, does this look like something you’d want to eat? I'm with that menu with the exception of plain yogurt. To me, it's a savory food and should be paired with savory foods or vegetables. Not fruit. I'm also all for everything else in the guest blog article. Makes perfect sense. Just…so much plain yogurt…ugh. I brought my home schooled 10 year old daughter downstairs to look at the menu and get her opinion. This child has high functioning autisim with serious food texture issues. Despite this, she has a wide and varied palate and though it's been a trial at times, she abides by a certain set of rules when it comes to eating. 1) While I won't force her to finish everything on her plate if she doesn't like it (This was an issue in our house where I was forced to eat foods I TRULY didn't like and it's one of the main factors in my eating disorders, that and my oral fixation…she got the autistic traits from me; diagnosed as an adult) she MUST try a bite of every food served, even if it's a food she has not liked in the past. 2) When we eat at a restaurant, she may choose her own meal, and has since she could read (well, she was three, so we did help her then, but she got independent about it quick) she must choose a meal that is appropriate for the restaurant. (or dinner stores, as she used to adorably call them) For example, if we are eating at a Middle Eastern establishment, one of our favorite spots (they're family owned and have known Ripley since she was a fetus, she's a favorite there and gets all sorts of amenities because she never orders from the kids menu and they know one of her first solid foods was THEIR hummus…) she cannot order chicken fingers and fries. She must order something from the menu proper. If we're eating Indian, same thing. The food must match the establishment we are dining in. Since we instituted that rule, ages ago, she's very vocal about it now, proud of it, and strict with herself about it. This child would not eat anything between two slices of bread for the first five years of her life, salads were not to be thought of, she refused hot chocolate made from melted hershey bars made by my dad once (and my dad can COOK ya'll) and one day while staying with friends she refused several attempts to get her to eat for the following reasons: the eggs were the wrong "color", the bread was weird, no she didn't want waffles or anything else. That last situation turned out to be more of a power struggle and Ripley testing her limits with Auntie Erin, though the eggs being the "wrong color" and the toast being the wrong texture I can understand. But since she couldn't get ahold of me (at the time my husband was at work, and I was traveling out of state to pick up our vehicle) she called my brother, almost in tears because she was afraid Ripley was going to starve. My brother calmly told her to not worry about it, and that she'd eat if she got hungry enough and that we would NOT blame her in any way for Ripley's behavior. The child would not starve in one day, and I'll say this for Ripley. If she refuses food, she won't later whine about how hungry she is. Anyway. All that to say that we perused the menu in the article, and one in the comments, from the French school in London, and she found them to be very yummy sounding, with the exception of the cheeses. We're still working on her eating cheese that's not "cooked" (ie melted.) We're several steps up from where we began when she wouldn't touch anything with cheese with a ten foot pole. She found the prospect of beet salad a novel idea and wanted to try it. She loves lentils, and since she now eats salad…sort of…it's still a work in progress; she found the mixed baby greens a delicious idea. Plus she's not like me with the plain yogurt. This is a child who was caught eating sour cream with a spoon, and early on we convinced her that plain yogurt was the same as sour cream (not the same THING but if you know Ripley breaking an automatic categorization before it begins makes life SO much easier) plus the influence of Middle eastern food in her life, she'd eat that up with no problem. Just the cheese she takes issue with, everything else? "That sounds really good." She wanted to know if she could get lemon with the salmon cubes in butter and wondered what else was in the veal stew besides baby cow and was curious about the pumpkin soup because she's never had it. But alot on that menu she was familiar with like the potato and leek soup and the lentils and from the other menu the vegetable cous cous and lamb and such for example. Anyway, there's my dollar and a half of opinion with way too much babble from me. Just so you know this isn't a regional exception, I live in the Dordogne and recently blogged about this very thing … including the menu for this month … just as lovely, served on real plates with real silverware and followed by real recess. What a concept! French mom whose US-born oldest child started K in the US this year here. I have been struggling for months now to get my son to eat a "real" lunch every day. After observing lunch at school once early in the year I asked for his cafeteria card to be cut up to make sure he never, ever eats anything provided by the school — on the plus side he was the one looking at his friend's corn dog with huge eyes and whispering in my ear that this looked really bad. He prefers his "cold" (I haven't been able to do better than tepid) lunch, but only has 15-20 minutes to get to the lunch tables, unpack his food and eat it, with classmates playing around and encouraging other kids to join them. One day out of three his lunchbox comes back completely untouched and he tells me he didn't have time to eat. Great story! Too bad it's just not true…. I am presently living & working in Canada (in its capital city, Ottawa) but I was born and grew up in Paris, France. I was pleased to read Ann's message and can confirm that all of it is true. Food is really "serious business" in France and we are raised with the motto : "eat a bit of everything, and enjoy your meals". I am not saying that school cafeterias would always be providing super tasty food (it can especially tasteless in university cafeterias!!) but there is really an emphasis on fresh products and a variety of meat & fish. I am truly appaled by what people eat here in Canada and seeing what Mrs.Q's students have to eat every day really makes me sad. Food should not be about convenience and cheapness, but about a wide variety of colors, tastes and combinations!!! And it's not that much more expensive to eat the latter way- proof being that in my country that's how it's done! I sure hope some changes can be done in the US and in Canada, but apparently the poor quality of food (whether in schools or supermarkets) goes back to many generations, so a lot of people just take it for granted that this is what their children will eat as well…..sigh, what a vicious circle! Just thinking of foods I wish had been served in cafeterias when I was growing up, I managed to create a fully functional menu for four weeks. I'm not an organic person and I love meat as much as the next person, but this is what I wish my child could be eating in school. I don't know why you are converting the euros into dollars. If your living in France, earning euros and paying euros then you would not take into account the exchange rate. The buying power of a Euro is comparative to a dollar if you are being paid in that currency. 3€ for a school lunch is not much at all, especially considering that it is a full meal and not fast food processed crap. It still blows my mind that school lunch haven't changed since the 80s when I was a kid in CA. I went to high school in France for a period of time and I remember being completely impressed by the food that was offered in the cafeteria. Menus were always posted in the morning. The meal always started off with a soup or salad, and there was always a hot portion of the meal such as couscous with vegetable sauce, or braised rabbit with vegetables. Sometimes they would do super risky dishes that would never be attempted in North American cafeterias, like steamed mussels or some other kinds of fish. There was always a side of bread you could take, and they offered a large variety of fruits up for grabs as well, such as halved grapefruits and apples. The meal always ended with a little dessert, such as yogurt (plain) or flan. You also got a little pitcher you would fill with water at the fountain to put at your table. However, it was quite expensive, with each lunch at around 5 – 7 Euros. Still, it was such an adventure each day to eat lunch! Wow now that is a yummy looking lunch menu! And best of all is the variety. Yes, Bring back nutritious meals to our schools. The French have a wonderful natural attitude to all things they eat – just simply the best! And family eating is so important it's the basis of teaching manners, respect and above all a healthy lifestyle. Jamie Oliver has tried to do just that here in the U.K. and I take my hat off to him. This is just so refreshing to read – school menus that are simply divine. The health of our children is so important, and family meals should be taken together whenever possible. As adults, let's make more of an effort and choose good food for all our family. So thank you for such a splendid article it is a pure delight to read how things really could be if only we took the initiative. Schools don't allow kids to take a packed lunch either. Exactly why that is I don't know. They couldn't eat any worse than the crap they get at the canteen.